I don't know about you, but sometimes the Bible is so brutally honest it hurts! We consider our world, our earth, to have been here a long time and assume it will be here a long time more. But God reminds us that it is temporary! We are even more temporary: just like flies, we're here for a short while, and then we're gone. But not gone, gone! 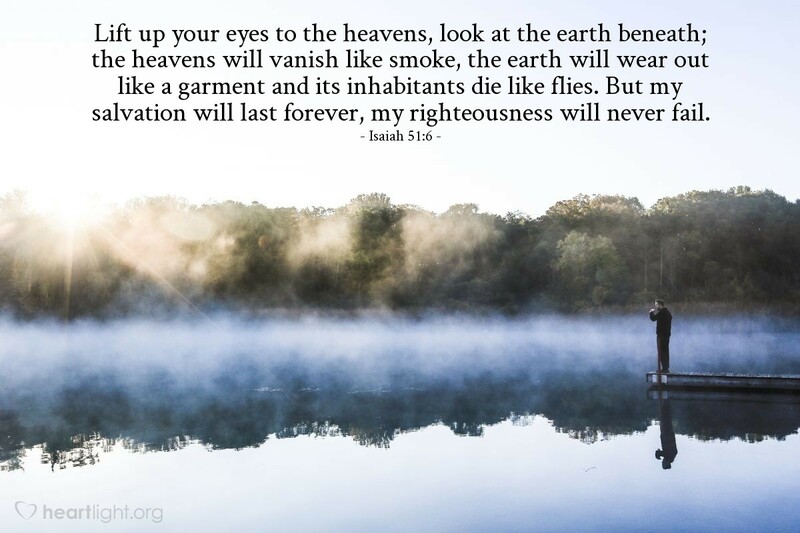 Christians are just gone from the temporary existence of earth because our lives are caught up with Christ in God's salvation which lasts forever and God's righteousness that will never end or fail. O Righteous Father who hears my prayers and strengthens me for the journey, thank you for the assurance that what I have as a Christian with you goes beyond the boundaries of death, the limitations of my humanity, and the vulnerabilities of my weaknesses. Thank you that I am tied to you and your salvation and that because of Jesus, you see me as your righteous and holy child. In Jesus' name I pray. Amen.